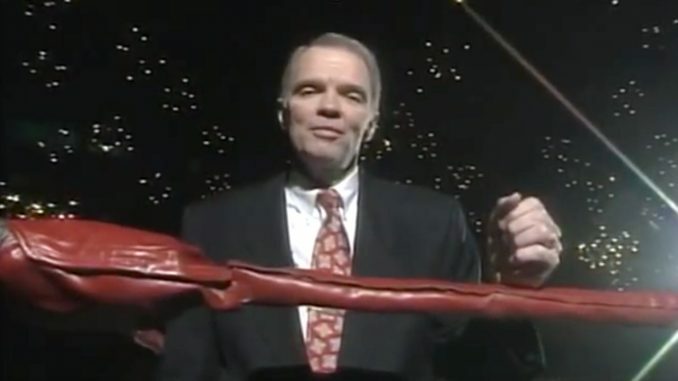 Larry Matysik has passed away at the age of 72 and we take a look at his career as an announcer, booker, author, and historian of St. Louis Wrestling. Larry Matysik, who served as the right-hand man to Sam Muchnick and eventually the voice of Wrestling at the Chase, has died. Matysik had numerous health problems for over a decade, including spinal stenosis, rotary scoliosis, trigeminal neuralgia, and was diagnosed with a destructive muscle condition known as Rhabdomyolysis this past January. Matysik was admitted into hospice care over the weekend and long-time friend Herb Simmons announced early Sunday that he had passed. Matysik first met Muchnick when he was 15 years old as Muchnick was a fan of his writing with Matysik writing about the matches and personalities. Matysik’s writing appeared in Ring Magazine and after writing a letter to Muchnick, he received a letter in response and began their friendship that lasted the rest of their lives. This led to Matysik getting a job and would work out of the office and write the programs. Muchnick and Matysik both had a deep appreciation for journalism with Muchnick coming from that background as a reporter for the St. Louis Times and was a respected figure within the city. Muchnick left reporting and would become a publicist for Tom Packs, who ran wrestling in that part of the country. In time, Muchnick would become one of the largest power brokers in the industry as NWA president and St. Louis becoming a mark of validation to headline. Wrestling at the Chase was an idea that spawned from Muchnick and Harold Koplar, who was the owner of KPLR-TV Channel 11 in St. Louis and the Chase Park Plaza Hotel. It opened the door for the weekly Saturday program that was taped inside the Khorassan Room at the hotel. The show premiered on May 23rd, 1959 and was hosted by Joe Garagiola, a former St. Louis Cardinals player. Garagiola would become a larger star when he was a regular on The Today Show and a frequent guest co-host with Johnny Carson on The Tonight Show. KPLR covered the production costs and paid the St. Louis Wrestling Club (the group that was formed with the launch of the program) $1,500 per taping day in exchange for 5% of the gates when they ran the Kiel Auditorium or local arena shows. Matysik began working full-time in the office by the end of 1970 and would go on to become the play-by-play announcer. He had a straight-forward style that was on point with the tone of the show by emphasizing credibility and calling the action as a pure sport with no logic gaps with respect to the viewer, and especially the skeptic. His duties would eventually include booking of the territory alongside Pat O’Connor until Muchnick’s retirement. Muchnick retired with a massive show at The Checkerdome on January 1st, 1982 and was a crossroads for wrestling in St. Louis. Matysik would break off from the St. Wrestling Louis Club, which Bob Giegel assumed leadership of, to run opposition after Matysik felt it was too different a product than the one Muchnick promoted. When the World Wrestling Federation was expanding nationally, they were able to secure television on KPLR-TV and ended with Matysik becoming the local promoter for the WWF but in a diminished capacity to what was originally planned. The WWF didn’t tape out of St. Louis for long, eventually sending their syndicated television to the market and were off the station by 1985. Aside from Muchnick, Matysik’s closest friend and partner in the industry was Frank “Bruiser Brody” Goodish, who worked with Matysik when they attempted to run opposition to Giegel in the market. Matysik had spoken to me over the years about Brody’s death and had an idea of writing a murder mystery novel, based on his death in Puerto Rico. When Dan Lovranski and I worked on a documentary project together on Brody, Matysik was instrumental in helping us to get his widow Barbara Goodish for an interview, which may have been the first one she did. Matysik never stopped following the industry and my stories interacting with Larry always centered around the industry and keeping up with the latest news, stories, angles, and the business impact. We spoke often in the mid-2000s when he put out several books, including “Wrestling at the Chase”, “Brody”, and “Drawing Heat the Hard Way”. We would speak on the phone and discuss the latest news and he was a fountain of knowledge to break down a story, relate it to history and try to figure out what it meant. In 2008, Matysik was promoting one of his books and he flew up to Toronto and I had him come into the studio for an interview. Afterward, it was sheer luck that he was staying at a hotel across the street from where I lived, and we met that night and chatted for hours. He had a genuine interest in my career, pursuing wrestling reporting, and a fascination with The Fight Network station I worked at previously. Larry thought The Fight Network was an interesting venture that was a 24-hour television station with a heavy emphasis on professional wrestling. It was this confidence he had, that led Matysik to sell his existing tapes of Wrestling at the Chase to the Fight Network rather than the WWE when the latter was throwing out money to acquire tape libraries for their 24/7 on-demand service. To this day, Anthem Sports and Entertainment have the rights to that footage and have released some of the content onto the Global Wrestling Network streaming service. I always felt more could have been done with that incredible footage, even the limited amount that was there. It was Jason Agnew, who worked at another Canadian station during this time called BITE TV, that helped coordinate a deal to license the footage from The Fight Network and create a series around the Wrestling at the Chase tapes. Agnew hosted the show and they were written by Dan Lovranski. I was so happy that the tapes were used rather than just sitting dormant. Matysik was instrumental in launching the St. Louis Wrestling Hall of Fame in 2007 and received the Jim Melby Award in 2014 at the Georges Tragos / Lou Thesz Professional Wrestling Hall of Fame. In recent years, Matysik had been helping to book the Southern Illinois Championship Wrestling promotion along with Herb Simmons. In January, Larry’s wife relayed to me the latest on his health status but noted that his incredible memory was intact. She added that he had finished a book project and had another one in progress that he was writing on his laptop. He had a love for writing, especially about professional wrestling and his books are an incredible resource for those studying history and putting statistics, attendance figures and gates into the proper context and decoding what they meant. Larry Matysik was 72 years old and is survived by his wife Pat and daughter Kelly.